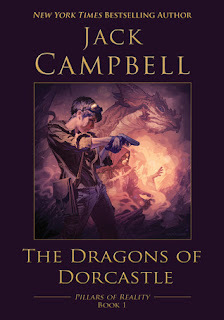 Book 29 of 2015 is The Dragons of Dorcastle by Jack Campbell. It is the first book in the Pillars of Reality series which I am no considering reading. It is your typical female engineer not respected in a man's world meets a sensitive boy with no social skills. Yes, I related to that part a little too much. The writing is simple and effective. The read was not challenging and the story was engaging. Jack Campbell does not write the in workings of the female mind well and the main female protagonist comes across in a Bella Swan way a few times but she is redeemed by her actions and overall character. Going back to reading fantasy is always a pleasure but it also reminds me that a lot of fantasy is just Mills & Boon for guys. 3.5 guild wars out of 5. Should I read this? Yes. I will at least read the next book. If you like fantasy and don't mind a but of a love story with dragons then this is for you. What did I learn? Geeks and geek dysfunction is so mainstream these days that every day books are portraying that life. I think that is an all-around good thing.